1Laboratorio de Microbiología Molecular y Biotecnología Ambiental, Departamento de Química & Centro de Biotecnología Daniel Alkalay Lowitt, Universidad Técnica Federico Santa María, Valparaíso, Chile. *Corresponding author: michael.seeger@usm.cl 2Programa Institucional de Fomento a la Investigación, Desarrollo e Innovación (PIDi), Universidad Tecnológica Metropolitana, Santiago, Chile. 3CCUG, Department of Clinical Bacteriology, Sahlgrenska University Hospital, Gothenburg, Sweden.4Department of Infectious Diseases, The Sahlgrenska Academy of the University of Gothenburg, Gothenburg, Sweden. Petroleum hydrocarbons are main pollutants in the environment. A complex combination of aliphatic, (ali)cyclic and polyaromatic hydrocarbons (PAHs) are present in petroleum hydrocarbon mixtures such as crude oil, motor oil and diesel fuel (Fuentes et al., 2014). Heavy metals, such as copper, cadmium, mercury, lead and nickel, are co-pollutants frequently present in hydrocarbon-contaminated sites (Amezcua-Allieri et al., 2005; Olaniran et al., 2013; Fuentes et al., 2015). Mining, agriculture and industrial activities, contribute with persistent organic pollutants (POPs) and heavy metal release into the environment, influencing the microbial communities (Hernández et al., 2011; Altimira et al., 2012; Fuentes et al., 2014; 2015). The Aconcagua River mouth in central Chile has been affected by crude oil pollution mainly associated to a petroleum refinery located next to the seashore. In 2002, high amounts of crude oil (70,000 L) were accidentally discharged into Aconcagua river mouth. High levels of PAHs were detected in the coastal reef next to the Aconcagua river mouth (Palma-Fleming et al., 2008). Bioremediation is an attractive technology for removal of POPs from the environment (Atlas and Philp, 2005; Morgante et al., 2010; Seeger et al., 2010; Ponce et al., 2011). Degradation of alkanes by Alcanivorax borkhumensis SK2, Pseudomonas putida GPo1 and Acinetobacter baylyi ADP1 has been characterized (Ratajczak et al. 1998; van Beilen et al., 2001). P. putida strains mt-2 and G7, and Acidovorax sp. NA3 are capable of degrading aromatic hydrocarbons (Velázquez et al., 2006; Singleton et al., 2009). Bioremediation, using hydrocarbon-degrading strains, has been successfully applied for crude-oil removal from environments (Silva et al.,2009; Fuentes et al., 2014; 2016). However, co-contaminated environments with heavy metals and organic pollutants are major challenges for bioremediation purposes. It has been reported that heavy metals inhibit microbial catabolic enzymes (Olaniran et al., 2013). Therefore, the isolation and characterization of heavy-metal tolerant bacteria for bioremediation of environments polluted with petroleum hydrocarbons and heavy metals is crucial. For the identification of bacterial isolates and to determine their phylogenetic relationships, genotypic characterization based on PCR amplification and sequence analyses of 16S rRNA genes has been commonly used. However, 16S rRNA gene sequence analyses often do not provide the resolution for definitive species-level identifications. Analyses of house-keeping rpoB and rpoD gene sequences is useful for a more exhaustive bacterial identification (Moore et al., 2010). Thus, the aim of this study was the isolation, identification and characterization of hydrocarbonoclastic and heavy metal-tolerant bacterial strains from a crude oil-contaminated soil at the Aconcagua river mouth in central Chile. Aromatic and aliphatic hydrocarbons were purchased from Merck (Darmstadt, Germany). HgCl2, CuCl2, NiCl2, CdCl2, Pb(NO3)2 (analytical grade) were obtained from Sigma Aldrich (Saint Louis, MO, USA). Antibiotic test discs were acquired from Arlab (Santiago, Chile). Bacterial strains were grown in Tryptic Soy Broth (TSB) or Bushnell-Haas Broth (BHB) minimal medium, using hydrocarbons as sole carbon sources. BHB medium contained (L-1): 1 g K2HPO4; 1 g KH2PO4; 1 g NH4NO3, 0.05 g FeCl3, 0.2 g MgSO4·7H2O, 0.02 g CaCl2 (Fuentes et al., 2016). Bacterial growth on hydrocarbons was determined in 96-well microtiter plates using the respiration indicator, 2,3,5-triphenyl-2H-tetrazolium chloride (TTC) as described by Fuentes et al. (2016). BHB medium was supplemented with 0.6% (v v-1) n-octane or n-hexadecane, 0.05% (w v-1) naphthalene, fluorene, anthracene or phenanthrene, or cyclohexane and toluene in gas phase as sole carbon source. Bacterial growth on TSB and BHB media without carbon source were used as controls. After incubation for 10 d at 30 °C, TTC and glucose, succinate or pyruvate were added. For heavy metal tolerances, Tris-buffered mineral salts (LPTMS) medium was used. LPTMS medium contained (L-1): 6.06 g Tris, 4.68 g NaCl, 1.49 g KCl, 1.07 g NH4Cl, 0.43 g Na2SO4, 0.2 g MgCl2·6H2O, 0.03 g CaCl2·2H2O, 0.23 g Na2HPO4·12H2O, 0.005 g Fe(III)(NH4) citrate, and 1 ml of the trace element solution SL7 of Biebl and Pfenning (Rojas et al., 2011). Hydrocarbonoclastic strains were isolated from a sampled contaminated soil by enrichment, using collected crude oil from a decantation sludge (DD) or a motor oil (DM) as sole carbon sources. Surface soil samples (020 cm) were collected from a crude oil-polluted site at the Aconcagua river mouth (32°55'27"S, 71°30'15"W), Valparaíso region (Figure 1a) and stored at 4 ºC. In addition to high levels of total petroleum hydrocarbons (TPH) in this area, high levels of copper (147 mg kg-1) and arsenic (34 mg kg-1) have been reported (Fuentes et al., 2015). Enumeration of hydrocarbon-degrading microorganisms in soil was performed, using TTC indicator and the most-probable-number (MPN) enumeration in microtiter plates (Fuentes et al.,2016). Briefly, 1 g of soil was suspended in BHB medium and agitated vigorously at room temperature for 2 h. After decantation at 4ºC for 2 h, serial dilutions were prepared from supernatant aliquots, using BHB medium containing a solution of 2.5% crude oil in acetone (1:1). Microtiter plates were incubated with agitation at 30ºC, and after 7 d, 0.01% TTC indicator was added. Ten grams of soil were added to 90 mL of BHB medium and 1% (v v-1) oil (DD or DM) as sole carbon source. Prior to inoculation, DD and DM were sterilized at 180ºC for 1 h. Cycloheximide (150 mg L-1) was added during enrichment to inhibit eukaryotic cell growth. Enrichments were incubated with agitation for 7 d at 30ºC. Enrichment cultures were subcultured on fresh medium at 7-day intervals. Isolates were obtained after three subcultures by spreading onto BH-agar plates with 1% (v v-1) crude oil, and purified by streaking on TSA agar medium at 30 ºC. Purity of strains was determined by colony morphology examination and by optical microscopy. Bacterial strains were named based on the crude oil used for enrichment (DD; crude oil from decantation sludge, DM; motor oil). Figure 1. Isolation and characterization of hydrocarbonoclastic bacteria. (a) Sampling site at Aconcagua river in Valparaiso region, central Chile is indicated with a black symbol. Industrial activities such as an oil refinery and copper mining industries are shown, (b) Colony morphology of hydrocarbonoclastic strains, isolated by enrichment using crude oil from decantation sludge (DD) or motor oil (DM), as sole carbon and energy source are shown. Cells grown on TSA medium were observed by optical microscopy (Leica Galen III Microscope, USA). Motility and Gram-staining were determined. Briefly, M9 minimal medium containing 0.3% agar, was supplemented with 0.2 % succinate, 0.1 % yeast extract and 0.05 % TTC indicator. Agar plates were inoculated and incubated overnight at 30ºC in a humidified container. Catalase activity was determined by adding 30% H2O2 in a slide containing a colony suspension in 0.9% NaCl solution. Antibiotic resistance profiles were performed in Mueller Hinton agar medium (Difco, New Jersey, USA), using test discs containing bacitracin (0.04 U), gentamicin (10 µg), erythromycin (15 µg), trimethoprim (5 µg), streptomycin (10 µg), kanamycin (30 µg), penicillin (10 U), rifampicin (30 µg), ampicillin (10 µg) and tetracycline (30 µg). Antibiotic resistance profiles were determined after incubation at 30ºC for 1214 h.
Tolerance to heavy metals was determined in LPTMS agar medium (pH 7.0), supplemented with 0.2% sodium succinate and 0.1% yeast extract. The metal salts were added, in solution, at 0.53, 0.9, 1.2, 1.4, 1.6 and 2.4 mmol l-1 Cu+2; 0.85, 1.0, 1.3, 1.5, 1.7 and 2.6 mmol l-1 Ni+2; 0.2, 0.5, 1.0, 1.45 and 2.4 mmol l-1 Pb+2; 0.22, 0.53, 0.9, 1.3, 1.8 and 2.7 mmol l-1 Cd+2 and 0.01, 0.02 and 0.05 mmol l-1 Hg+2 (Nies, 1999; Rojas et al., 2011). Heavy metal tolerances were determined by the presence or absence of growth after 5 d incubation at 30ºC. Minimal inhibitory concentrations (MIC) were determined as described (Nies, 1999; Rojas et al., 2011)and plates were incubated at 28 °C for 5 d. The lowest concentration of metal salts that prevented growth was determined as the MIC (triplicate). DNA was extracted by suspending a “loopfull” of the biomaterial in 100 μl of TE buffer and incubated at 95 °C for 10 min. After centrifugation, supernatant was transferred to a clean tube and stored at -20 °C for further analyses. The 16S rRNA genes were amplified by PCR, using 27f (5’-AGAGTTTGATCMTGGCTCAG-3’) and 1492r primers (5’- TACGGYTACCTTGTTACGACTT-3’). PCR conditions were performed as described previously (Altimira et al.,2012). PCR products were purified using Qiagen kit (Hilden, Germany), and sequenced at CCUG, University of Gothenburg (Gothenburg, Sweden) and Macrogen (Seoul, Korea). For Pseudomonas strains, partial sequencing of RNA polymerase subunit B (rpoB) (LAPS/LAPS27: 5´-TGGCCGAGAACCAGTTCCGCGT-3´ and 5´-CGGCTTCGTCCAGCTTGTTCAG-3´) and RNA polymerase subunit D (rpoD) (PsEG30F/PsEG790R: 5´-ATYGAAATCGCCAARCG-3´ and 5´-CGGTTGATKTCCTTGA-3´) was done. For Acinetobacter strains, rpoB genes (Ac1055F/ Ac1598R: 5´-GTGATAARATGGCBGGTCGT-3´ and 5´-CGBGCRTGCATYTTGTCRT-3´) were sequenced. 16S rRNA gene sequences were deposited at the European Bioinformatics Institute (EBI). The rpoB and rpoD gene sequences were deposited at NCBI. Phylogenetic trees were constructed based on comparative analyses of 16S rRNA, rpoB and rpoD genes. In this study, sixteen hydrocarbon-degrading bacteria were isolated from a crude oil-polluted soil sampled close to the Aconcagua river mouth. This highly polluted soil contained 1×104 hydrocarbon-degrading bacteria per g of dry soil. Hydrocarbonoclastic strains were isolated by enrichment after three subcultures with crude oil from DD or DM. According to Gram-staining analyses, isolates were Gram-negative, except strain DD76. Most strains were cocci-shaped, whereas DD74, DM88 and DM95 were rod-shaped (Table 1). Most of the isolates exhibited cream-colored colonies with circular shape and smooth texture (Figure 1b). Only isolates DD74 and DM88 showed colonies with irregular borders (Figure 1b). Isolates DD74 and DM88 exhibited brown colonies, and strain DM95 showed pale-brown colonies, with rough and dry texture. Strain DD76 formed reddish-pink colonies. All isolates were catalase positive, and only DD74 and DD76 strains were motile. All isolates were resistant to bacitracin and penicillin. Additional resistance to kanamycin, ampicillin and tetracycline were observed in Gram-positive strain DD76, whereas Gram-negative strain DD75 possessed additional resistance to erythromycin and tetracyclin (Table 1). *Cells grown on TSA at 30ºC for 24 h. Colony shape: i, irregular; c, circular. Texture: r, rough; s, smooth. Color: br, brown; pb, pale-brown; cr, cream; rp, reddish-pink. † S, sensitive; R, resistant. 16S rRNA gene sequence analyses of bacterial isolates are summarized in Table 2. Strains DD74 and DM95 belong to genus Pseudomonas, showing 99% identity to P. stutzeri ATCC 17588T. Isolate DM88 showed 99% identity with P. chloritidismutans AW-1T. Strain DD76 showed 99.6% identity with Kocuria rosea DSM 20447T. Strains DD75, DD78, DD79 and DM90 exhibited 99% identity to A. radioresistens DSM 6976T. Isolate DM84 showed 99% identity with Acinetobacter calcoaceticus ATCC 23055T. Strains DD77, DM80, DM81, DM82, DM83, DM85 and DM86 exhibited 97% identity with Acinetobacter calcoaceticus ATCC 23055T. aGene sequences were deposited at the European Bioinformatics Institute (EBI) from EMBL-EBI, under the accession numbers indicated in brackets. bGene sequences were deposited at the National Centre for Biotechnology Information (NCBI) under the accession numbers indicated between brackets. For a more exhaustive identification of the isolates, analyses of housekeeping rpoB and rpoD gene sequences were performed. The rpoB genes analyses of Acinetobacter isolates were in agreement with the 16S rRNA gene sequence analyses. 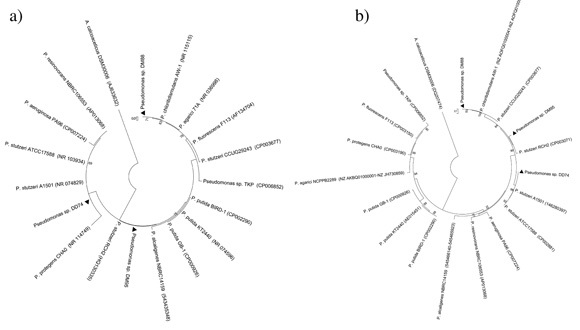 Phylogenetic trees showed that the Acinetobacter strains belonged to two main evolutionary clusters, derived from 16S rRNA (Figure 2a) and rpoB gene sequence analyses (Figure 2b). Strains DD77, DM80, DM81, DM82, DM83, DM84, DM85 and DM86 were clustered with A. calcoaceticus DSM 30006T. Strains DD75, DD78, DD79 and DM90 were clustered with A. radioresistens DSM 6976T. Figure 2. Identification of novel hydrocarbonoclastic Acinetobacter isolates by comparative sequence analyses. Phylogenetic trees based on v2-v3 regions of 16s rRNA (a) and rpoB (b) gene sequences. Trees were constructed with ClustalW alignment and maximum-likelihood clustering. Bootstrap values (1,000) are shown for each branch. 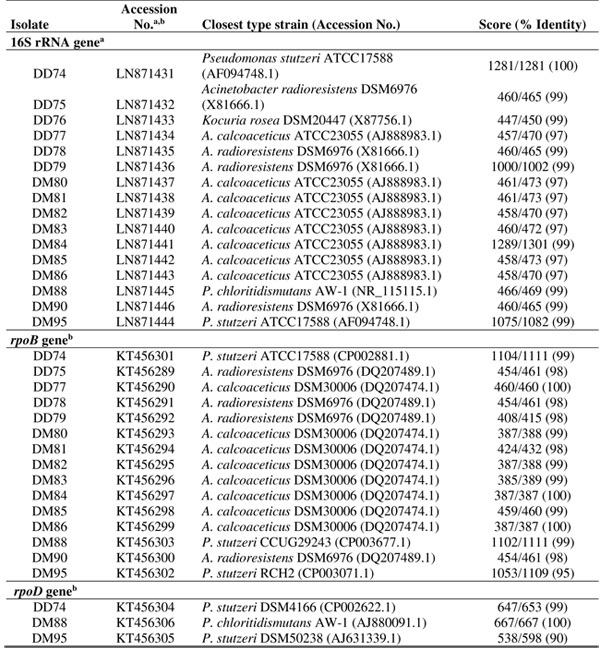 Comparative rpoD, rpoB and 16S rRNA gene sequence analyses strongly suggested that Pseudomonas strains DD74 and DM95 are related to P. stutzeri. 16S rRNA and rpoD gene analyses indicated that Pseudomonas sp. DM88 possessed high similarity to P. chloritidismutans AW-1T, whereas rpoB gene analyses showed that strain DM88 is related to P. stutzeri. Phylogenetic trees based on 16S rRNA gene (Figure 3a) and rpoB-rpoD concatenated genes (Figure 3b) sequences indicated that Pseudomonas strains DD74 and DM95 are clustered with P. stutzeri strains A1501 and RCH2, respectively. Although rpoB sequence analyses indicated that strain DM88 is closely related to the naphthalene-degrading type strain P. stutzeri CCUG29243T (Figure 3b), comparative 16S rRNA and rpoD analyses (Table 2) and phylogenetic trees based on 16S rRNA and rpoB-rpoD-concatenated gene sequences strongly suggest that the isolate DM88 is highly related to P. chloritidismutans AW-1T (Figure 3). Figure 3. Identification of novel hydrocarbonoclastic Pseudomonas strains by comparative sequence analyses. Phylogenetic trees based on v2-v3 regions of 16s rRNA (a) and rpoB-rpoD-concatenated gene sequences. (b). Trees were constructed with ClustalW alignment and maximum-likelihood. Bootstrap values (1,000) are shown for each branch. The sixteen bacterial isolates showed growth in crude oil as sole carbon source. Most isolates were able to grow on an alkane or a PAH. Eleven isolates showed growth on n-hexadecane as sole carbon and energy source (Table 3). A. radioresistens strains DD75 and DD79, Acinetobacter sp. strains DM81 and DM82 showed growth on n-hexadecane and an aromatic hydrocarbon (i.e., fluorene or phenanthrene). P. stutzeri DD74 and Acinetobacter DM82 were able to grow on naphthalene and phenanthrene, respectively. A. radioresistens DD75 and DD79, Acinetobacter sp. DM81, P. chloritidismutans DM88 and P. stutzeri DM95 grew on fluorene. * +, Growth; , No growth. †Minimal inhibitory concentration (MIC) on the corresponding metal ion. ‡Reference MIC value in E. coli (Nies, 1999). Interestingly, thirteen isolates possessed tolerance to copper and eleven strains showed tolerance to cadmium. P. stutzeri DD74, K. rosea DD76, A. calcoaceticus DM84, A. radioresistens strains DD78 and DM90, Acinetobacter sp. strains DD77, DM80, DM81, DM82, DM83 and DM85 possessed high tolerance to copper (MIC 1.6 mmol l-1) (Table 3). A. radioresistens DD75 and Acinetobacter sp. DM86 possessed moderate tolerance for copper (MIC 1.2 and 1.4 mmol l-1, respectively). In contrast, A. radioresistens DD79, P. stutzeri DM95 and P. chloritidismutans DM88 showed low tolerance to copper (MIC < 0.80 mmol l-1). A. radioresistens DD78, A. calcoaceticus DM84 and Acinetobacter sp. strains DD77, DM80, DM81, DM82 and DM85 exhibited a high tolerance to cadmium (MIC 1.3 mmol l-1), whereas P. stutzeri DD74, P. chloritidismutans DM88, A. radioresistens DD75 and K. rosea DD76 possessed moderate tolerance (0.53 mmol l-1) (Table 3). All strains were more sensitive than E. coli to Hg+2 (0.01 mmol l-1), Ni+2 (0.85 mmol l-1) and Pb+2 (0.532.4 mmol l-1). Hydrocarbon-degrading bacteria possessing heavy metal tolerance are essential for bioremediation of petroleum-contaminated soils that contain high levels of heavy metals. In this study, sixteen hydrocarbonoclastic strains were isolated by enrichment using crude oil from a decantation sludge and a diesel motor oil as sole carbon sources. All bacterial isolates showed resistance to antibiotics (2-5) tested. This is not surprising, since antibiotic resistance is widely spread in environmental bacteria. The extensive use of antibiotics in agriculture in the Aconcagua valley is an important source of antibiotics in the environment. Based on 16S rRNA, rpoB and rpoD gene sequences analyses, bacterial isolates were affiliated to the genera Pseudomonas and Acinetobacter. Isolates from the genus Acinetobacter were the most abundant (Table 2). In a previous study, one diesel-enrichment from a hydrocarbons-polluted soil at Aconcagua river estuary was mainly composed by Pseudomonadaceae, whereas a second diesel-enrichment was composed by Acinetobacter, Rhizobiaceae and Moraxellaceae, suggesting that Pseudomonas and Acinetobacter are the predominant cultivable hydrocarbonoclastic bacteria in these soils (Fuentes et al., 2016). 16S rRNA and housekeeping gene sequences analyses indicated that isolated strains were affiliated to the genera Acinetobacter, Pseudomonas and Kocuria. Three isolates (DD74, DM88 and DM95) were affiliated to the genus Pseudomonas according to 16S rRNA sequence analysis. These results were in agreement with the 16S rRNA and rpoB phylogenetic analyses, indicating that DD74 and DM95 strains are closely related to the type strains P. stutzeri A1501 and RCH2, respectively (Figure 3). The genome of root-associated P. stutzeri strain A1501 contains genes involved in the degradation of aromatic compounds (Yan et al., 2008). P. stutzeri RCH2 was isolated from a retired nuclear reactor complex with high levels of heavy metals contamination, particularly chromium (Han et al., 2010). Although morphological differences were observed between DD74 and DM95 strains, comparative sequence analyses support that these isolates are highly related to P. stutzeri reference strains. P. stutzeri typically form irregular, hard and dry colonies. However, the colonies shape can change after repeated transfers in laboratory conditions, becoming smooth and pale in color, phenomenon that has been described as colonial dissociation (Lalucat et al., 2006). According to rpoB gene sequence analysis, strain DM88 is closely related (99%) to the type strain P. stutzeri CCUG29243 (Table 2). 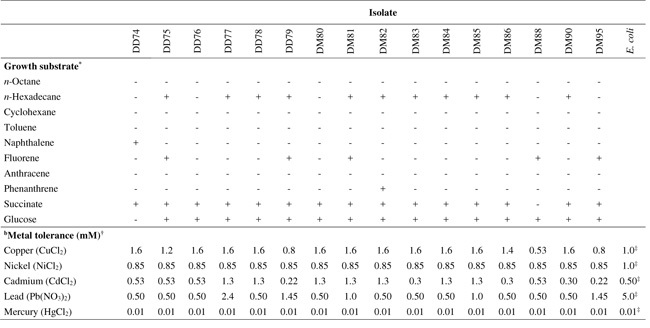 However, comparative 16S rRNA sequences and rpoB-rpoD-concatenated tree indicate that DM88 strain is highly related to the type strain P. chloritidismutans AW-1 (Table 2 and Figure 3). Wolterink et al. (2002) reported the chlorate reducer P. chloritidismutans sp. nov. AW-1T, possessing 100% 16S rRNA gene sequence identity to P. stutzeri DSM 50227 and 98.6% to P. stutzeri DSM 5190T. However, a DNA-DNA hybridization approach along with physiological and biochemical analyses indicated that P. chloritidismutans AW-1T and P. stutzeri strains belong to different species (Wolterink et al., 2002). In this study, phylogenetic analysis using 16S rRNA and rpoB sequences indicated that most of the Acinetobacter isolates were related to the type strain A. calcoaceticus DSM30006T and the phenol-degrader A. calcoaceticus PHEA-2, which were isolated by quinate enrichment from soil and wastewater (Zhan et al., 2011), respectively (Figure 2). Four isolates were closely related with A. radioresistens DSM 6976T, which was isolated from cotton sterilized by γ-radiation (Chan et al., 2012) and grew slightly on diesel (Mara et al., 2012). However, a 97% identity in 16S rRNA gene sequences analyses suggested that seven isolates (DD77, DM80, DM81, DM82, DM83, DM85 and DM86) probably represent novel species. A previous report suggested that a 16S rRNA genes similarity of <97% likely represents a novel species (Drancourt et al., 2004). Genotypic characterization based on PCR amplification and sequence analyses of 16S rRNA gene has been a method widely used for the phylogenetic relationships and identifications of bacteria. However, rRNA gene sequence analyses do not offer resolution for definitive species level identification. Different methodologies for phenotypic characterizations, such as cell morphology and metabolic profiling, allow differentiation of taxa at higher level (Moore et al., 2010). Nevertheless, further analysis will be needed for the identification of these Acinetobacter isolates. Differences in antibiotic resistance and heavy-metal tolerance profiles were found among these Acinetobacter isolates. For example, DM81 and DM82 isolates possessed different heavy metal tolerance profile (Table 3). Interestingly, the isolates DM81 and DM82 were able to grow on fluorene and phenanthrene, respectively (Table 3). Strains from genera Acinetobacter and Pseudomonas showed also interesting catabolic abilities along with heavy-metal tolerance. In this study, P. stutzeri sp. strains DD74 and DM95 were able to grow on naphthalene and fluorene, respectively (Table 2). P. stutzeri AN10 and P. putida G7 have been model strains for the study of naphthalene degradation (Lalucat et al., 2006). However, P. stutzeri able to metabolize fluorene has been poorly described (Stringfellow and Aitken, 1995). Interestingly, P. chloritidismutans strain DM88 was able to grow on fluorene (Table 2). To our knowledge, this is the first study that describes a P. chloritidismutans strain able to grow on fluorene. Previous reports have described the isolation of PAH-degrading bacteria possessing heavy metal tolerance from co-contaminated sites. Naphthalene-degrading and mercury-tolerant Clavibacter, Arthrobacter and Acidocella strains were isolated from a contaminated coal storage pile site (Dore et al., 2003). Paenibacillus and Pseudomonas strains isolated from a PAH-polluted lagoon were able to degrade naphthalene and possessed tolerance to lead (Pepi et al., 2009). Although strains from the Pseudomonas genus that aerobically degrade diverse aromatic hydrocarbons have been reported, in this study we describe two strains (P. stutzeri DD74 and P. chloritidismutans DM88) that are able to metabolize fluorene and possess tolerance to copper and cadmium. Interestingly, P. stutzeri RCH2 is tolerant to copper and zinc (Vaccaro et al., 2016). Although n-hexadecane degradation by Acinetobacter strains has been widely reported (Koma et al., 2001; Kang and Park, 2010), reports of Acinetobacter strains possessing heavy metal tolerance together with PAH degradation abilities are scarce. Acinetobacter strains tolerant to chromium, nickel and cadmium that are useful for heavy metal bioremediation have been described (Bhattacharya and Gupta, 2013). In this study, almost all Acinetobacter isolates were able to grow on n-hexadecane as sole carbon source and possessed tolerance to copper and cadmium. Remarkably, Acinetobacter sp. strain DM81 grew on n-hexadecane and fluorene, whereas Acinetobacter sp. strain DM82 showed growth on n-hexadecane and phenanthrene as sole carbon sources, both possessing tolerance to copper and cadmium. A. radioresistens DD75 showed growth on n-hexadecane, fluorene and tolerance to copper and cadmium (Table 3). High levels of copper in crude oil-polluted soils from Aconcagua river estuary are probably related to copper mining activities along the Aconcagua Valley (Fuentes et al., 2015). Copper, calcium and arsenic are main drivers of microbial communities in Aconcagua river estuary soils (Fuentes et al., 2015). Accordingly, Sphingomonas, Stenotrophomonas and Arthrobacter strains possessing high copper resistance (MIC 3.1  4.7 mmol L-1) have been isolated from copper-polluted soils at Aconcagua valley (Altimira et al., 2012). Therefore, it was not surprising to find that most of the hydrocarbonoclastic isolates the Aconcagua river mouth possessed heavy-metal tolerance. The strains isolated and characterized in this study are promising biocatalysts for bioremediation. 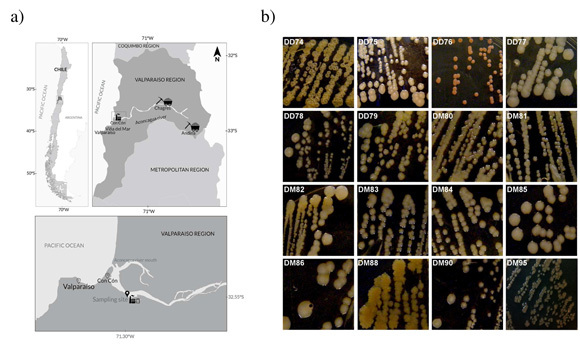 In this study, sixteen hydrocarbonoclastic bacteria belonging mainly to Acinetobacter and Pseudomonas genera has been isolated from a crude oil-polluted soil close to Aconcagua river mouth, central Chile. Isolated strains were able to grow on different petroleum hydrocarbon components (i.e., n-hexadecane or a PAH). Notably, most bacterial isolates possessed tolerance to copper and cadmium, which represents an advantage for the design of bioremediation strategies. Future studies will include bioaumentation using these novel Acinetobacter and Pseudomonas strains for the clean-up of petroleum-polluted sites that contain heavy metals. The authors thank Pola Miralles for support in sampling. This study was financially supported by FONDECYT 1151174 & 1110992, CN&BS and USM 131562, 31342 & 131109. V. Méndez, S. Fuentes, V. Morgante and M. Hernández acknowledge financial support from CONICYT, MECESUP and RIABIN fellowships. Velázquez, F., De Lorenzo, V., Valls, M. 2006. The m-xylene biodegradation capacity of Pseudomonas putida mt-2 is submitted to adaptation to abiotic stresses: evidence from expression profiling of xyl genes. Environ. Microbiol. 8, 591-602.